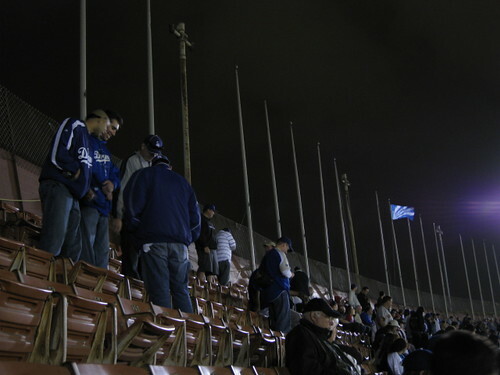 This was the scene when the PA announcer gave the world record-setting final attendance number of 115,300 during the seventh inning of the Dodgers – Red Sox exhibition game at the Coliseum. (Which petered down to what I would guess to be about ten to fifteen thousand in the 9th, a complete shame considering that watching Papelbon get lit up was the most exciting part if the night.) For comparison, USC football games draw just over 92,000 and the LA Raiders played to a nation 65,000 strong. Quiet, but still lively as we spent the time between innings counting the number of fights and thrown beers we could see from our seats, along with monitoring Flag Watch 2008. Look at how spiffy the place looked during batting practice. It only took one to go and soon everyone along the top railing realized they could take home a souvenir. 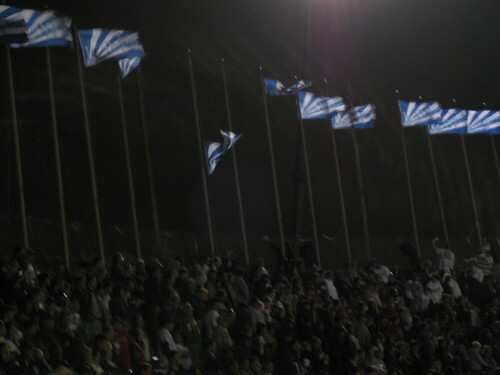 By the end of the night the top of the stadium was almost bare. Sad really. That one must have had an extra knot in the cord. Feel free to check out the rest of my flickr set of the day, including what appears to be a serious steroids problem in the beer pong world. Special note for the Yinzer Mafia – Can you believe this guy’s vanity plate I saw in the parking lot? Kind of creepy. 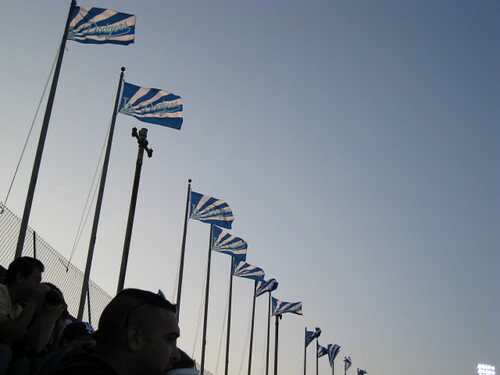 ~ by Sarah Sprague on March 31, 2008. I would say more than a little creepy. Unless that was Roethlisberger. And even then why would he want a vanity plate basically calling himself out everywhere he goes? I’m thinking about this too much. I’m more concerned about anyone who would drive a Mustang, period. I rented a Mustang Convertible last time I was in N’awlins. Big let down. Heaviest frigging car I’ve ever been in (aside from Saabs), not great acceleration, and hideous to be in with the top up. The Shelby has a bigger, finer tuned engine, and is actually a nice drive, but it’s still a Mustang in the end. I guess you just have to live in L.A. to appreciate the uselessness and impracticality of vehicles. 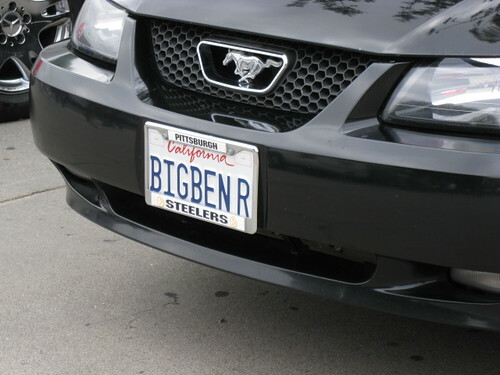 Seeing a Mustang with a “BIGBENR” license plate is hardly less than common-place. We just embrace the car culture out here whole-heartedly in ways that make everyone else seem like a bunch of Fiat-loving doofuses. 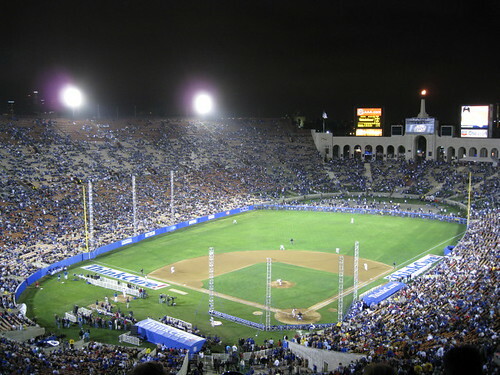 I think the only thing that could have made this exhibition game that much better is when then hooligans began to loot the stadium, they chose that exact moment to play Randy Newman’s enigmatic theme, “I Love L.A.” Things like that make living in this city worth it. Never a dull moment.